Artist Kristen Stein : Art, News & More: Surviving my first Wholesale show: Part 5: New pictures and Information from "The Buyer's Market"
Surviving my first Wholesale show: Part 5: New pictures and Information from "The Buyer's Market"
Part 5: Addendum. More pictures from the show and additional observations. I'm excited to let folks know that we had a great response to yesterday's 4-part post about "Surviving my First Wholesale Show". I received emails from several people asking if the posts could be cross-referenced on their blogs. Information from the posts will be included on Sandy Dell's site Selling to Gift Shops, Bill Weaver's The Artist's Center, and the Rosen Group's Wholesale Matters Blog on the AmericanCraft.com site. Many thanks to Laura Bamburak and Jean Thompson (Public Relations and Marketing Director for "The Buyer's Market" and the Rosen Group) for getting pictures of the February 2010 "Buyer's Market" to me. Jean also provided a lot of great information that I will incorporate into this new Part 5 post. Hope you all find it useful. Remember...if you still have specific questions about the event, please let me know by leaving a comment below, or emailing me directly through my site. You can also visit the BMAC's Wholesale Matters Blog, or Facebook Page. New information about the 'Visiting Artist's Program". 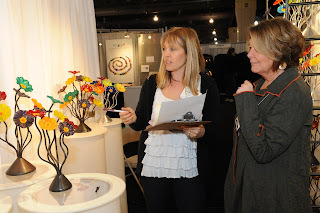 Jean let me know that the next 'Visiting Artist's Program" will be this summer at the BMAC show in Baltimore. The seminar will last only one day as the Summer Show is shorter than the February show. The tentative date is Monday, August 23, 2010. More news will be available next month. Thrilled to be able to share with you pictures from the February 2010 "Buyer's Market of American Craft" Show at the Philadelphia Convention Center. These were just emailed to me from Jean with her helpful comments. Great picture showing items at eye-level and with spotlighting. Jean suggests the goose-neck lights that are easily adjustable. Jean: Here’s another booth that is simple, but again, displays the work up high at eye level (and above). In this case, products that should hang are hanging. It gives the buyer a sense of what the product will look like to the customer. Notice the buyer also is holding the catalog to help with selection. Jean: Note that the shelving is simple and unfussy, propping the artwork at different levels and allowing compatible groupings of the product lines. Kristen: I think he's writing his order on the same Purchase Order Book that I described in Part 3. Got mine at Staples. Jean: It’s very interesting to see that so many artists let the “art” be the “art” of the display. The simple pedestals and tables do not distract from the beautiful art. Ample lighting, as you’ve noted, really helps. Some simple and large signage works. And note how people take advantage of the height of the booths – so buyers can see the work from across the aisles and above the busy, busy distractions. Most also, as you note, arrange their products for walk-up viewing. If you have specific questions not addressed in Parts 1, 2, 3, 4 or 5 of “Surviving My First Wholesale Show”, write to me and let me know. I’m happy to answer a question if I can. Also, remember to visit BMAC's Wholesale Matters Blog, or Facebook Page. The pictures from the show were wonderful to see. It was interesting that the booths were designed plainly as not to compete with the art. Thank you again for sharing your knowledge with us! You are a priceless member of our UWIBTEAM! Hi Deborah- I do know of a few vendors who did not write a single order. They did receive inquiries and exchanged information. So, perhaps this will pay off down the line. The show didn't meet my loftiest of goals (was hoping for catalog sales....one or two images purchased in large quantity and chosen by the buyer to be exclusive to their catalog/store). But it met my 'realistic' expectations given the economic situation and the bad weather. At the time I signed my contract, I had a scheduling conflict for the Baltimore show and requested two back-to-back Philly shows. This had to be approved by the show's director. As an exhibitor years ago with The Buyer's Market, I've seen that unfortunately this show has gone seriously downhill. It used to be extremely hard to get into - being accepted one month beforehand was unheard of, and the February show was the most desirable of the two. There were many, many more booths and the aisles were packed with buyers. I walked the show as a guest last summer, and several old friends who were still exhibiting told me they were appalled at the lack of traffic and the slide in quality. This was once a powerhouse in the craft industry, and it's sad to see the result. Many sales are being made online these days, and retailers are loathe to travel. Trade shows in general have suffered, and it may be permanent. Those glass works look amazing. And the colors are fabulous. Very well done!